Crafting Confessions: 'chair-ishing' the holidays! Today I'm featuring not one, but TWO cards. Well it's the same card but using a different colour but that still counts as two right? These cards are for our new challenge on our PTI blog; the theme is friendship. I have to say that this theme is totally appropriate for both Kate and I seeing as we spent this past weekend together in person along with our other crafty friends Caryn and Steph. We shopped til' we dropped, chatted non-stop and finally managed to see Eclipse at the cinema! It's rare I get weekends like that so I really treated myself both with food and clothes shopping *wink*! Needless to day, gotta work off the treats in the gym for the next 6 weeks now LOL! Full deets and a couple more pics of these cards are over here if you're interested! Oh and there's a rather funny pic of Kate and I on our weekend together posing in matching tops we were trying on during our girly shopping spree! Oooh and you know that if you live in Europe and play along with our challenge, you could be the lucky recipient of the sweet lil' PTI stamp set, Fly Away! So don't delay, play along today! Lovely set of cards. How I would give anything to sit on the couch with my best friend and just chat for an afternoon! Ohhhh, Aimes, you've really done with these cards! They've got two of my favorite colors, buttons, ribbons, dots, and one of my favorite PTI sets! Love, love, love these to bits! Love your cards--fab colors! Glad you had a fun, relaxing weekend and can look forward to some well deserved playtime! Oh Wow these are soooo gorgeous, I just love those vibrant colours and the style, think I can feel a CASe coming on....lol. They are both great! Love the colors! Glad to hear you had a fun time with your friends. Hope you enjoy your summer vacation! Gorgeous cards Aimes! Man, those bows sure are purdy :) Love the colors! are you kiddin' me? These are absolutely pure perfection girl...love the tone on tone stamping...gotta remember that one....gorgeous stuff, as always! Great cards! I love how you put the sentiment on top of the chair. These are both fantastic Aimes! Such beautiful colours and I love the clean lines. I'm hoping to get some time to play along with this challenge fingers crossed! 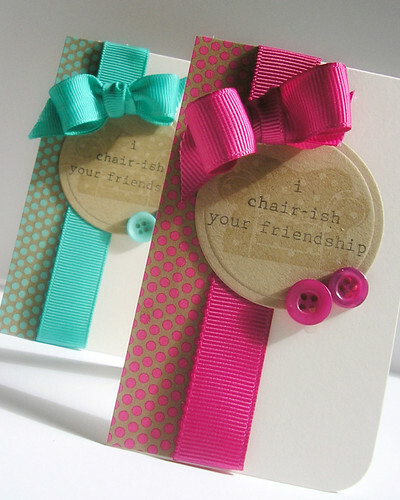 Aimes I totally adore these sweet little cards, I love your colour combos and the brown on craft looks really great! Ohh...be still my heart! I love these cards!! So beautiful! I'm a big fan of PTI too!! Hey Aimes, long time no see! Thought I'd take a few and start catching up on the ole' bloggos. Glad to hear your summer break has begun. You're off to a fine summer break crafting start with these cards! My friends are headed back to school in a couple of weeks. I just finished making them some of Mish's notepads.